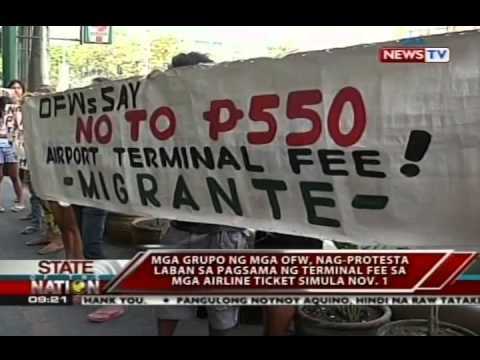 Migrante International strongly protests the automatic inclusion of the Php550 terminal fee in airline tickets. This new rule was enforced via Memorandum Circular-08, Series of 2014, following a memorandum of agreement between the Manila International Airport Authority (MIAA) and airline carriers. MC-08 was supposed to have been effective last November 1, 2014 but its implementation was postponed as a result of a temporary restraining order issued by the Pasay Regional Trial Court in response to a petition filed by various stakeholders. This year, the MIAA once again announced that the implementation of MC-08 is scheduled anew on February 1, 2015, indicating that the TRO has been effectively lifted. This position paper enumerates the main reasons for Migrante International’s strong opposition to the imposition, and consequently, its call for the scrapping of MC-08. MC-08 violates Section 35 of RA 10022 clearly stipulating that overseas Filipino workers (OFWs) are exempt from paying airport taxes, documentary taxes and terminal fees. MC-08 defines OFWs as among “locally-recognized exempted passengers” and recognizes the Overseas Employment Certificate (OEC) as an “exemption certificate” certifying OFWs’ exemption from payment of the IPSC. However, it in the same breath offers a mechanism for “refund” for exempted passengers “on or after departure date”. The refund mechanism in itself corroborates that MC-08 has all intents and purposes to breach Section 35 of RA 10022 by providing clear opportunities for its direct violation. MC-08’s mere recognition of OFWs’ exemption from the payment of the terminal fee does not mean that it does not have intent to violate the law, nor does a refund mechanism correct this very violation. Rather, it paves the way for indirect and/or direct violation of RA 10022 by exacting illegal fees from OFWs obscured only by a supposed “refund mechanism” to justify it. It is significant and imperative to state in this argument that Section 35 of RA 10022 was borne out of the collective unity and action of OFWs against onerous state exactions and other illegal fees. That MC-08 attempts to disparage this historic achievement is unacceptable, a direct insult to OFWs and an infringement of their hard-earned rights. While MC-08 provides that it aims to “remove unnecessary barriers to travel and simplify travel regulations” and that it attempts to “address the congestion in all Ninoy Aquino International Airport (NAIA) Terminals with the increasing volume of passengers” by “promoting smoother, seamless, convenient, safe and hassle-free travel experience”, it only envisions such for a portion of its passengers and discriminates against exempted passengers, including OFWs. Simply put, it aims for better, more efficient and “decongested” aiport terminals not for the entire passenger population but at the expense of OFWs – more than 5,000 leaving the country on a daily basis. MC-08 will mean another process that OFWs can do without. OFWs, pre-departure, have already gone through all the trouble of fulfilling requirements for the OEC. To make them undergo another tedious refund process is clearly an added burden. The refund process is another unnecessary step that OFWs have to face. It is nothing but another extortion scheme banking on OFWs’ inconvenience and exasperation. To be able to get a refund, OFWs are required to present an assortment of documents that they would otherwise not bother to procure because they would have been conveniently covered already by the OEC. Does the government hope to exact more illegal fees from OFWs through this? The Philippine Overseas Employment Administration estimates 5,031 OFWs leave the country everyday. This would mean a total of Php2.8 billion in potential daily earnings for the government should OFWs find it too cumbersome to get a refund, or a Php1.009 trillion for a year! It is also interesting to note that the MIAA had been forwarding the proposal to automatically include the Php550 terminal fee in airline tickets since 2011 but found it hard to get the approval of even the airline carriers. Further, the DOJ directed the MIAA to “craft a system of collecting the PTF while, at the same time, giving due regard to those who are exempt.” Based on statements made by the MIAA, however, there is no special mechanism crafted by the agency. It deemed it “impossible” to create even a data base of OFWs to aid in the recognition of their exemption upon airport ticket point of sale. And following airline carriers’ initial reluctance, they cannot be relied upon to craft a likewise system themselves. The sole burden then of showing proof of entitlement for exemption and/or refund/reimbursement lies on OFWs alone. Interestingly, MC-08 also does not seem knowledgeable of the fact that majority of agency-hired newly-hired OFWs (not Balik-Manggagawa) have their airline tickets purchased by either their employers or recruitment agencies who are not authorized to hold or present their OECs. This is another loophole in the new rule that inconveniences not only on OFWs but their employers and agencies as well. Lastly, MC-08 attests that it hopes to comply with “internationally accepted standards of airport accomodation and service” by “promulgat(ing) rules and regulations governing the planning, development, maintenance, operation and improvement of the airport”. However, again, in the same breath it underestimates such a noble endeavor by simplistically surmising that the problem lies only in the “congestion and queuing problems (that will) escalate further as traffic volume continuously increases”. This entry was posted in References and tagged MIAA, Migrante International, noynoy aquino, OFW, state exactions, terminal fee. Bookmark the permalink.